You are here: Home » China Watch » China building 3 dams over Yarlung Tsangpo river? 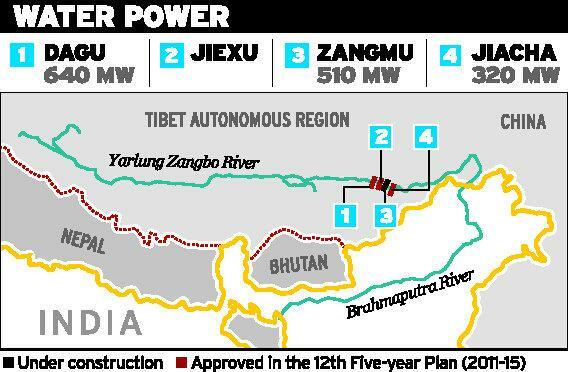 (TibetanReview.net, Aug02, 2015) – China appears to have approved the construction of three more hydropower projects on the mainstream of the Yarlung Tsangpo river (Brahmatputra in India) in occupied Tibet, India’s Water Resources Minister Ms Uma Bharti has said. However, in the absence of details, their likely impact could not be assessed, India’s PTI news agency Jul 31 cited her as saying, replying to a question in the Lok Sabha, the Lower House of Indian Parliament, on Jul 30. China previously denied having any plan to dam the river until satellite pictures showed a major construction at Zangmu in Tibet in a near-completed stage. It then contended that the dam was a run-of-the-river (RoR) hydroelectric project and would not affect the river’s flow into India. However, China’s 12th Five-Year Plan covers the period of 2011-15. So the dams, if planned, should be in advanced stages of completion.